"Did I mention our BBI products are Proferred by Professionals?" RC Fasteners & Components is an ISO9001:2015 certified industrial fastener supplier, stocking industrial and commercial fasteners combined with specialty components for aerospace, precision electronics, and other specialized industries. We also provide several value-added services including bin stocking, kitting and assembly, re-work services and more to provide you with complete solutions for all your industrial fastener needs. Our company is also committed to making a difference in the lives of our employees, customers and community by serving them with compassion, enthusiasm and a commitment to excellence. See our about us page for more or contact us to learn about our industrial fastener offerings. For over 30 years, we’ve built strategic relationships with industry-leading manufacturers, enabling us to offer top quality industrial fasteners and components at factory-direct prices. Through these partnerships, we also provide precision CNC machining on specialty, made-to-print parts, both domestic and import. If you are looking for industrial fasteners near you, contact RC Fasteners & Components! 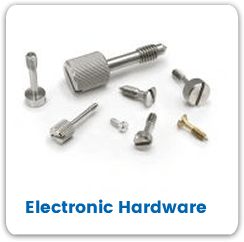 Our online store features over 50,000 types of in-stock fasteners including electronic hardware, screws, metric fasteners, bolts and much more. We also offer FREE SHIPPING for all wholesale industrial fasteners ordered from our in-stock inventory. Our goal as a fastener supplier is to be a one-stop-shop for all your fastener needs. We specialize in hard-to-find fasteners and components and offer custom industrial fastener solutions for specialty applications. Browse our featured product selections below or request a quote for wholesale industrial fasteners. For specialty applications ranging from industrial to aerospace, we offer custom print industrial fasteners that are created using a lathe to provide precise tolerances to +/- .0001”. 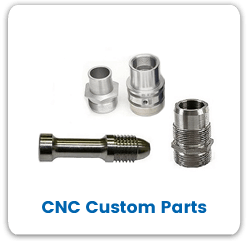 Custom CNC machined industrial fasters are available in several materials including aluminum, stainless steel, and brass and are manufactured in an ISO 9001 certified facility. 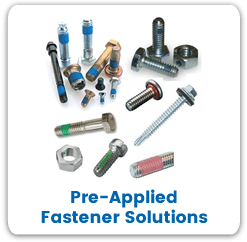 We work with several manufacturers to get you the best custom fasteners possible and can assist you with selecting the right option for your high precision applications. 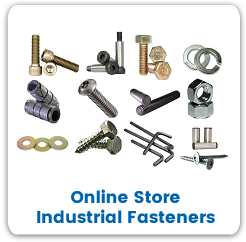 Visit our online industrial fastener store for a wide selection of wholesale fasteners and components in every size and shape imaginable. Our in-stock inventory ships for free and includes anchors, keys, nuts, screws, rivets and much more. If you are unable to find the items you need in our online fastener store, request a quote for industrial fasteners in the size and style you need. We carry a large inventory of electronic hardware from leading manufacturers. Our selection includes captive panel screws, standoffs, precision shoulder screws, spacers and thumb screws in various materials and standard or miniature sizes. We also offer a wide selection of wholesale nylon electronic hardware that is strong, lightweight and resists corrosion. Industrial fasteners made of rubber or elastomer are used by industries including automotive, aerospace, laboratory, and others. Our wholesale offerings include anti-vibration rubber mounts, die cut rubber gaskets, and various types of extruded rubber hardware such as screws, bushings, grommets, O-rings and more. We partner with Nylok® to offer nylon patched self-locking industrial fasteners in inch and metric sizes. These industrial fasteners feature a nylon self-locking element that provides a secure hold that will not budge, even with exposure to extreme vibration and harsh operating environments. Self-clinching fasteners are widely used in sheet metal applications and the manufacturing of computers, vending machines, automobiles and other fabricated metal products. 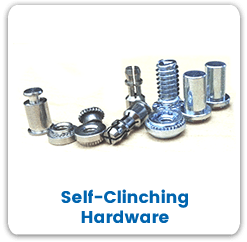 We carry a variety of wholesale self-clinching fasteners including weld nuts, self-clinching standoffs, self-clinching studs, and more. Our vendor managed inventory programs are designed to reduce pricing and quality control costs and can be tailored specifically to meet the needs of the customer. These services include Kanban, frequent volume-based bin stocking, bar coding, and VMI kitting, to name a few. All inventory, purchasing, replenishment, and quality control is monitored by RC Fasteners & Components, so you don’t have to! Our goal is to be your #1 fastener supplier, providing you with ALL the fasteners and components you need. By consolidating your vendor base, we save you time and money, and we all know that’s the name of the game. RC Fasteners & Components is your component and industrial fastener supplier. Find out why customers keep coming back to us, year after year. Get a quote today, or contact us to learn more.